Gayatri is the most renowned of the Vedic mantras. 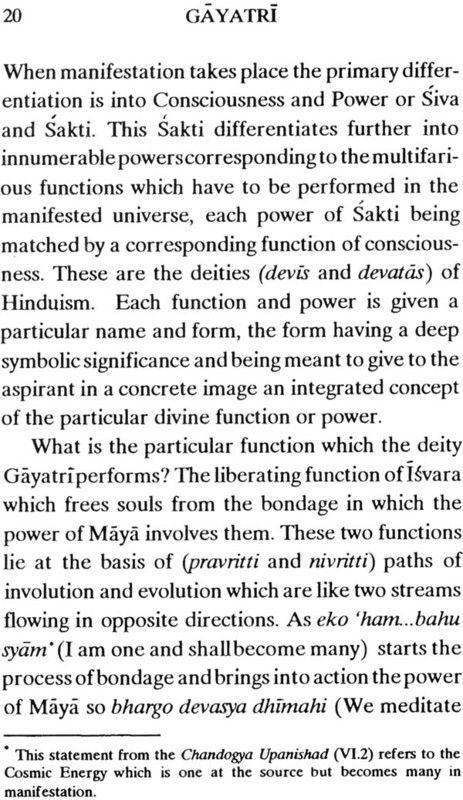 Addressed to Savitr, symbolizing the Supreme light of all Lights, it forms part of a traditional Hindu sacrament. But in reality, there is nothing Hindu about it. 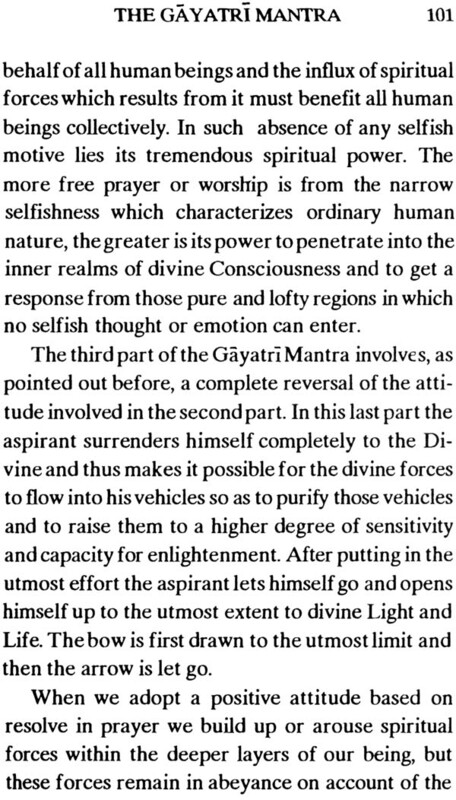 A lofty prayer unmatched in its sublimity, it is as well a prayer for the whole of humanity. 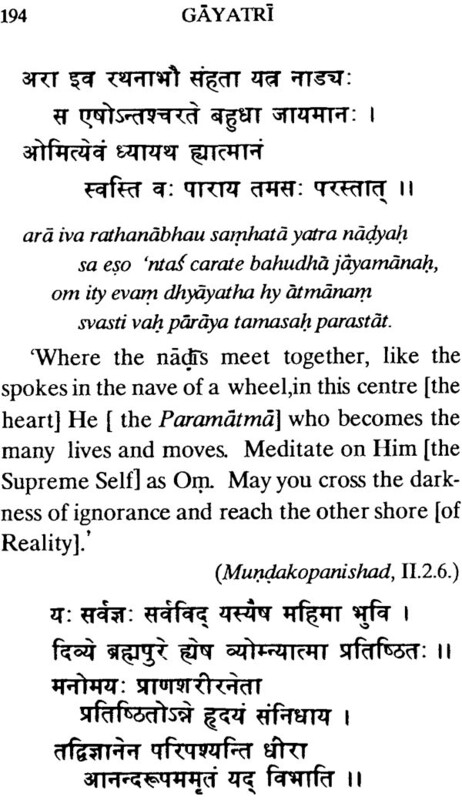 A japa or meditative utterance of it needs no accompanying rite and anyone can reverentially participate in it. 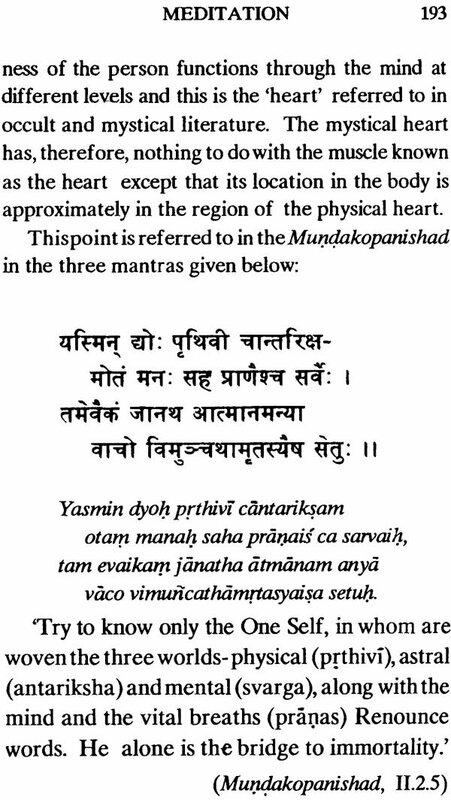 Prof. Taimni succinctly treats all aspects of the sacred mantra. He was Professor of Chemistry at he University of Allahbad in India and was a distinguished member of The Theosophical Society. His deep interest in the yogic path resulted in the publication of The Science of Yoga a study of the well known Sutras of Patanjali which elicited worldwide appreciation. He also provided expositions of the Kashmir Saiva philosophy. 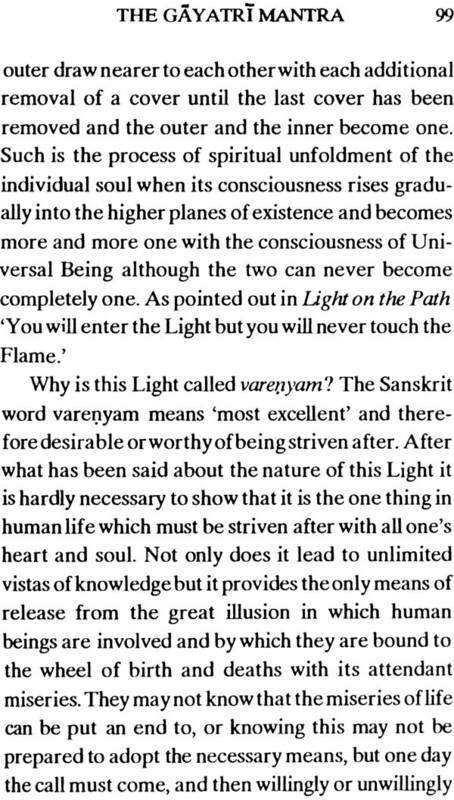 THE edifice of self-culture which leads ultimately to enlightenment rests on three pillars -character- building, upasana (adoration, worship) and Yoga. While the importance of Yoga in this field is recog- nized, the necessity of character-building and wor- ship is not usually appreciated in sufficient degree and aspirants are exhorted to enter the path of Yoga without any preparation whatsoever. Such a course results generally in failure, frustration and a conse- quent loss of faith in yogic methods. It is only when the aspirant has developed the requisite traits of character and a dynamic urge to find the Truth that he can steadily tread the path of Yoga. The former problem has been dealt with by the author in his book, Self-Culture and the latter in the present volume. It is only when the ground has been well prepared by self-discipline and worship that the aspirant can usefully take up the practice of Yoga, which is dealt with thoroughly in The Science of Yoga. 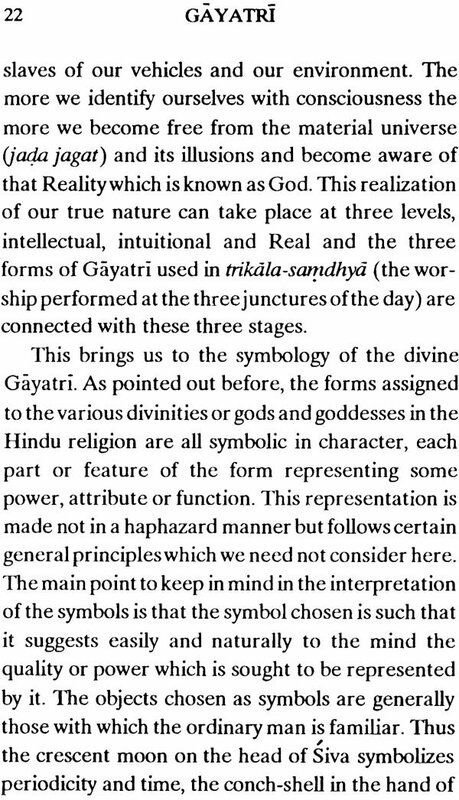 The three books are, therefore, in a sense, complementary in character and throw light on different aspects of the sddhana or way which leads to Self-realization. 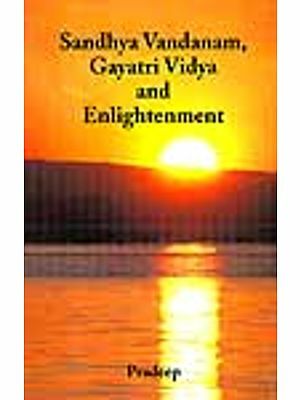 Although this book is meant primarily for those with the mental background of Hindu thought and tradition, some of the general principles presented in it can be applied by all aspirants in their self- direction for spiritual culture. 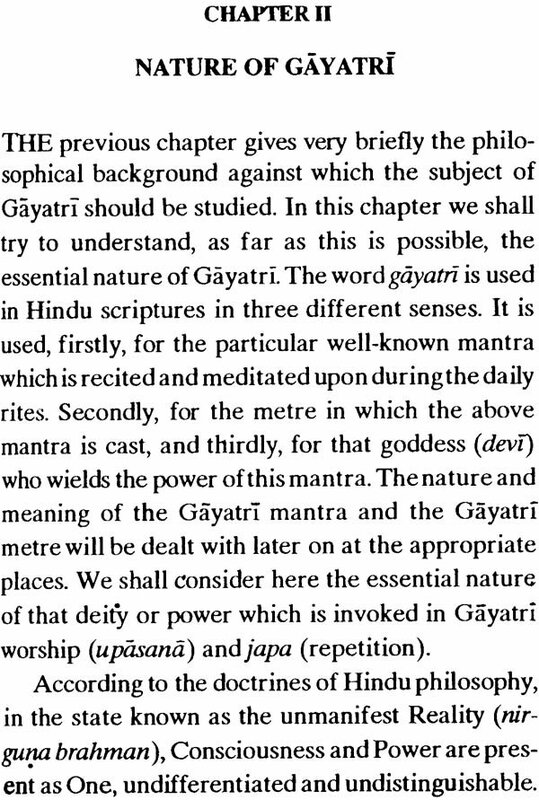 THE japa (meditative utterance) of the Gayatri is an integral part of the daily practice of the Hindus (samdhya). 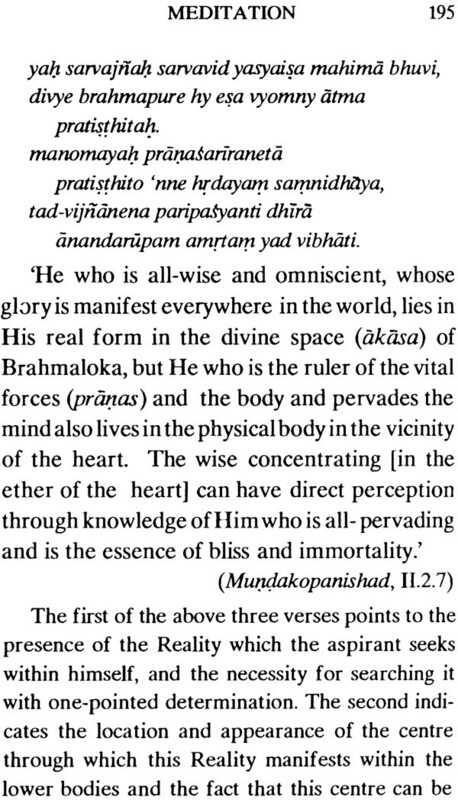 This shows that Hindu sages (rishis) at- tached the greatest importance to it not only in the life of those Hindus who were deeply religious and were seriously pursuing the ideal of spiritual eman- cipation (moksha), but also in the life of the average Hindu who was living the ordinary worldly life in the pursuit of so-called happiness. In order to under- stand why Hindu sages regarded the japa of Gayatri so essential, all that is necessary for us is to detach ourselves for a while from the current of worldly life and look at the condition of the vast number of people who are resistlessly being borne along that current. 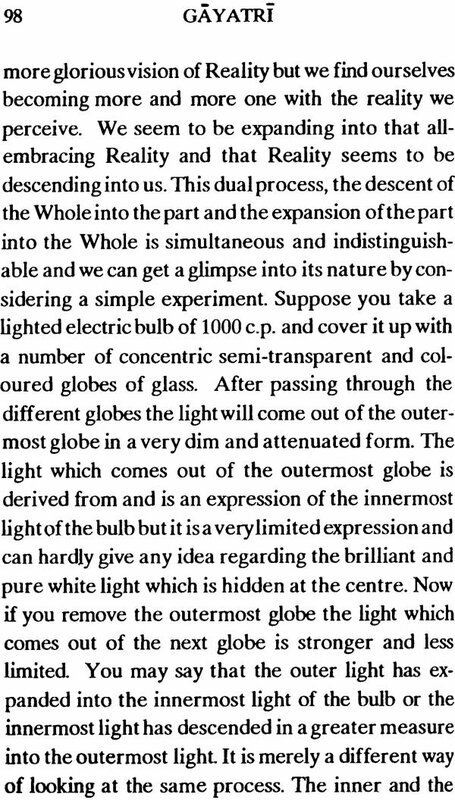 As long as we remain a part of that current and do not look at life deeply and impersonally, we fail to notice things which should be obvious to any intelligent person. 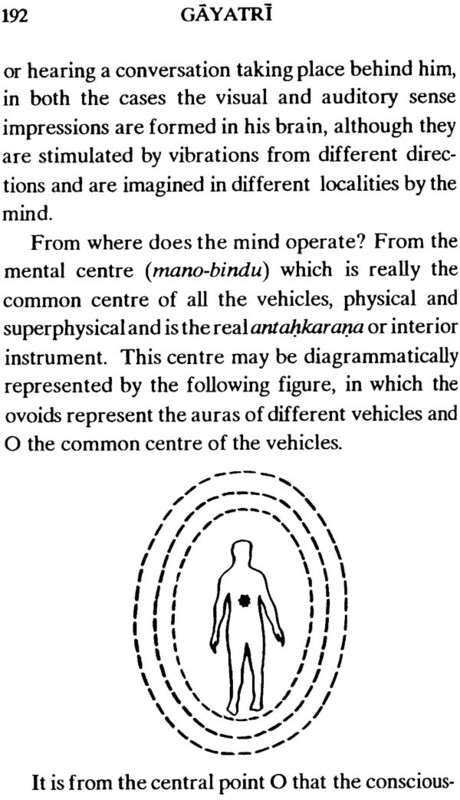 Take for instance, the complete immersion of the common man in the life around him without any thought or awareness of the background against which human life should be seen. Most of us are utterly oblivious of the fact that we are here for a very brief period and are an insignificant part of a vast and apparently unlimited universe. An insect crawling on the Himalayas has comparatively a greater significance from the purely physical point of view. We enter this life by the gateway of birth and after spending about seventy years on this planet under all kinds of circumstances we disappear by the gateway of death. 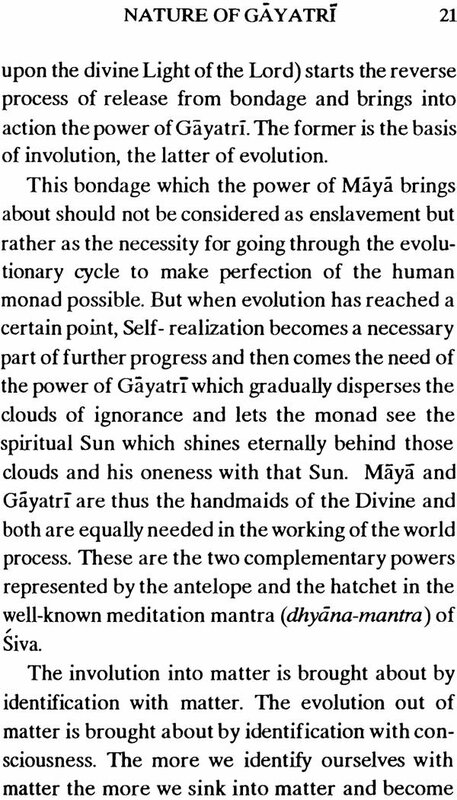 This procession of living beings has been going on for thousands of years and yet it does not occur to many people to ask the very pertinent questions as to where we have come from, where we shall go and why we are here. Our zest for life whether it is pleasant or unpleasant, our absorp- tion in the interests which we have developed, is so complete that we are not even aware that the great problem of life faces us all the time, that an over- whelming mystery surrounds us. Not only are we pursuing our personal little aims in an apparently meaningless world in a haphazard manner but we show the same lack of intelligence in dealing with the larger problems of humanity. There is utter lack of any guiding principles or ideas indi- cating the direction in which we have to go. There is a vague idea that we have to promote the welfare of humanity but what real welfare means and how it is to be obtained are questions about which there is bitter controversy and mortal conflict So much so that we are ready poised to destroy in an atomic war the larger part of that very humanity for whose betterment we are supposed to be working and fighting! Could there be a more apt illustration of this prevailing lack of intelligence, despite the ex- traordinary intellectual achievements of science and undoubtedly high mental calibre of those who guide the destinies of nations? This is a great book. 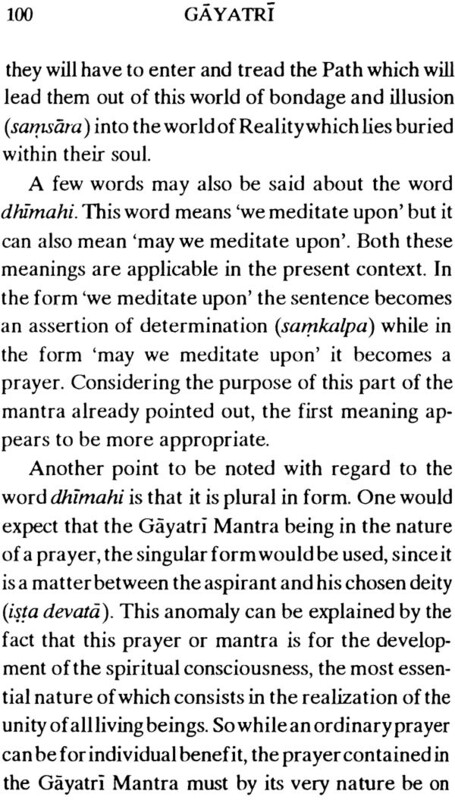 I got an older version from my guru - he recommended it to gain some extra valuable theoretical background to my practice of the Gayatri mantra chant. It is quite philosophical, yet accurate and deep. Very easy to read as well.